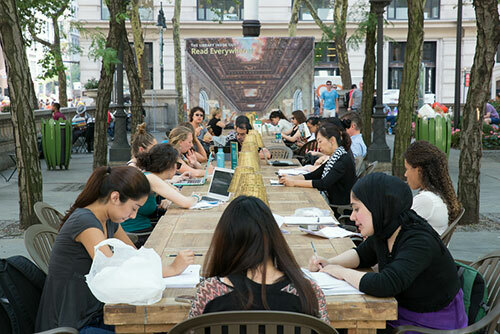 From Aug. 5 until Aug. 22, the Library will quite literally bring reading to the street, opening an outdoor reading room on the plaza of the Stephen A. Schwarzman Building on Fifth Avenue and 42nd Street. We welcome you to visit — and take a photo there. Reading is an adventure. It can take you anywhere — to distant lands, back in time, into the future, to outer space — without leaving your favorite library branch . . . or armchair . . . or park bench . . . or fast food table . . . or subway car . . . or . . . This summer, The New York Public Library celebrates the excitement and personal joy of reading with the hashtag #ireadeverywhere. Beginning on Aug. 5, we are asking all of you to join authors, librarians and other readers from all over the world to share your favorite — and unusual — reading spots, along with the hash tag and our handle, all in an effort to inspire others to pick up a book (or an e-reader) and start their own adventures. Be sure to follow NYPL on Twitter, Instagram or Pinterest to see the best #ireadeverywhere selfies that we’ll share daily. For more than 100 years, The New York Public Library has brought the power of books to patrons of all ages, both within our branches and beyond — from book drives and bookmobiles to visits to hospitals, factories, and more. We are excited to continue that mission — join us! Next Queens, NY: Senator Jose Peralta Sat. Aug. 9th – Helps Kids with Back to School Supplies Too!